I’ve been really getting into using wool and fitteds at night, so when betterforbabies.com told me they were sending me a Little-To-Big Beetle diaper and a Little-To-Big Organic Wool Cover, I was really anxious to try them. No doubt what I pulled out of my mailbox was what I’d been waiting for! Better For Babies sells natural and organic baby products including diapers, covers, soaker shorts, trainers and other accessories. Better For Grownups sells reusable facial rounds, sateen tissues (really want to try these!) and family cloth, all crafted from fair trade organic cotton. 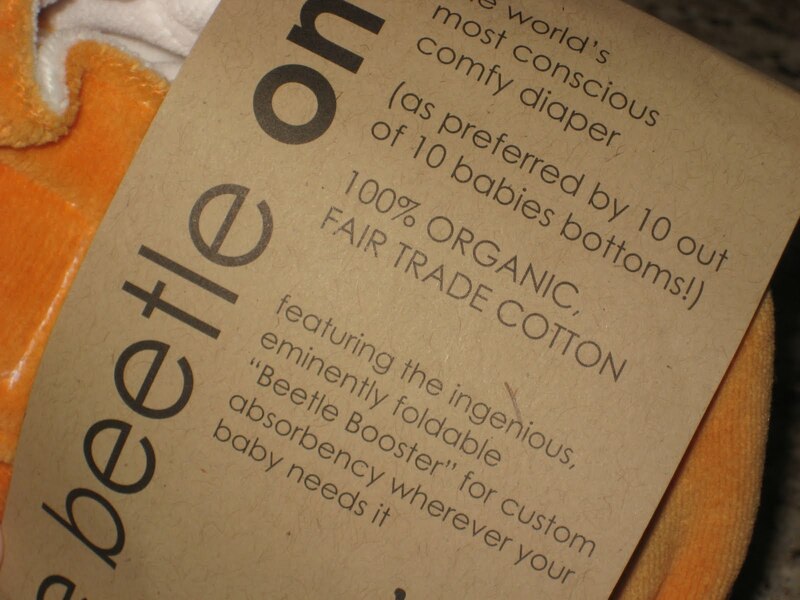 As the package says, the diaper is 100% organic, fair trade cotton, and is sweatshop free! They’re actually made in the U.S.A. wow! 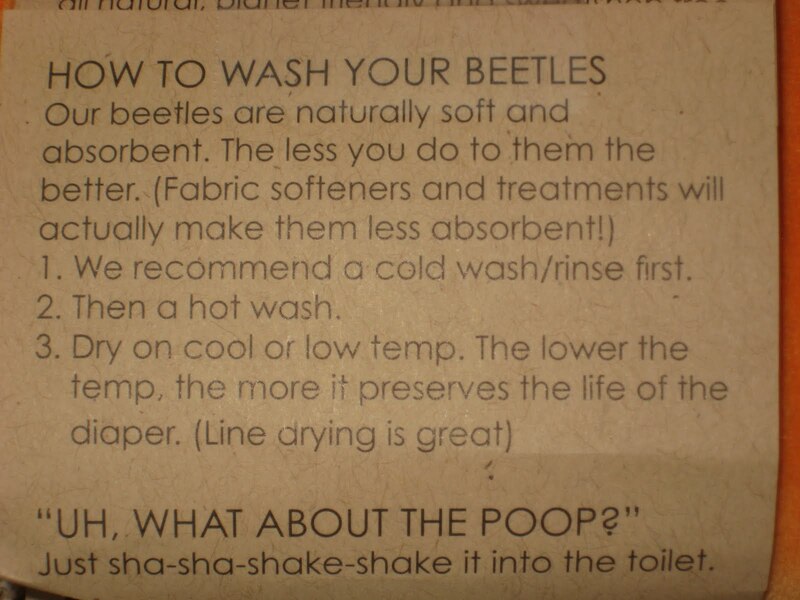 That’s the first time washing instructions have made me giggle. Tee hee! The orange is adorable, and the diaper is super soft and squishy. Nice velcro closures. Thus far, they are actually easy to get off of the laundry tabs, but still stick to them in the wash. I have too many that I struggle to free from the grasp of the laundry tabs, but in the washing machine they’re all like “Meh, whatever, we don’t like you anyway,” and become besties with 3 other diapers. Gah. 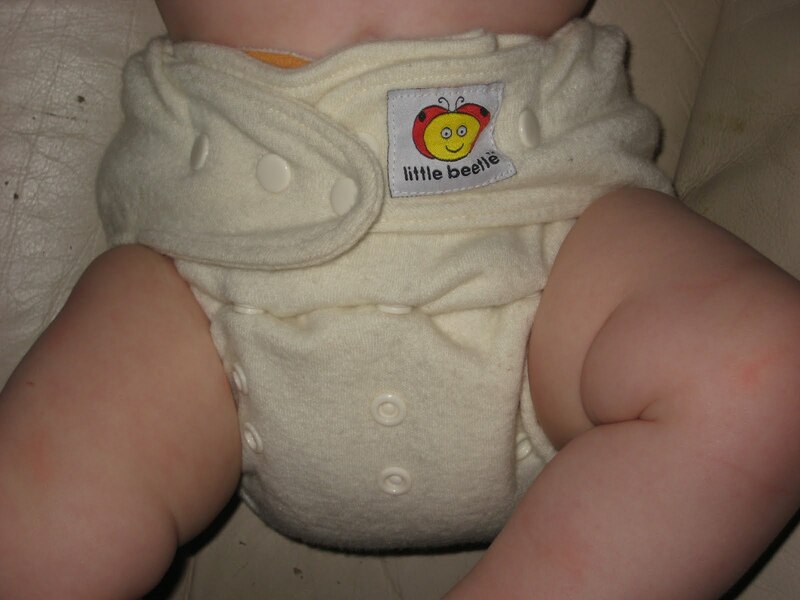 The velcro strip on the front of the diaper had that funny, stiff feel/sound like the Rumparooz. I actually debated taking a video of me crinkling it, but decided that would be a little weird, ha ha. Once I put the diaper on him though, it wasn’t stiff and didn’t dig into his belly. I think it must just be whatever the velcro strip is backed with making that sound. This diaper is a one size (6-36 pounds) and it’s the first one size fitted I’ve owned that has the snap down rise for sizing. Love this. One thing I found really unique is that the soaker is sewn in, just at one point on each side of the middle. 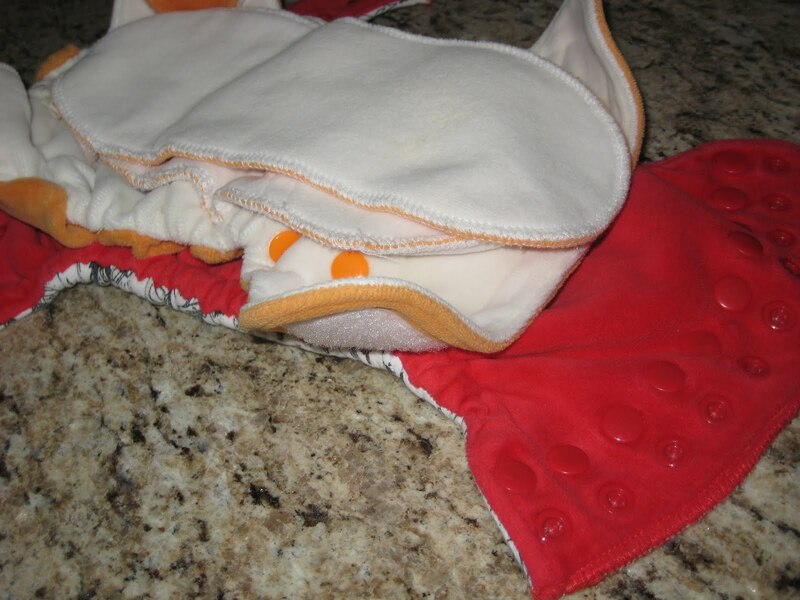 So, no matching up soakers or snapping them in after washing, but it’s not sewn all the way into the diaper, allowing for better cleaning & easier drying. You can slip the booster out to fold it and place in where needed (wet zone), or you can tuck it under the soaker to be held in place. At first glance, it seems a lot smaller overall than other one-size fitteds, even all the way unsnapped. Actually though, it just seems that way because the elastic is drawn a bit tighter. Fully stretched, they are just about the same size. Snapped on the smallest rise setting and unstretched, they are quite small. I don’t doubt they really would fit on a 6 pound baby! I used it on the medium setting on my little guy (who is about 16.5 lbs and 27.5 inches). It fit wonderfully, and I think he could wear this setting for a while. This was so easy to put on him. I love my other fitteds, but this is so much more Daddy friendly. My hubby gets really frustrated by the soakers to pull up and fold over and adjust, rises to fold over and rows and rows of snaps. I folded the booster in half, placed it in the wetzone, and used the diaper coverless the first time. It was the last diaper before bed and he hadn’t uhh, “used the facilities” by the time I put his night time diaper on him. 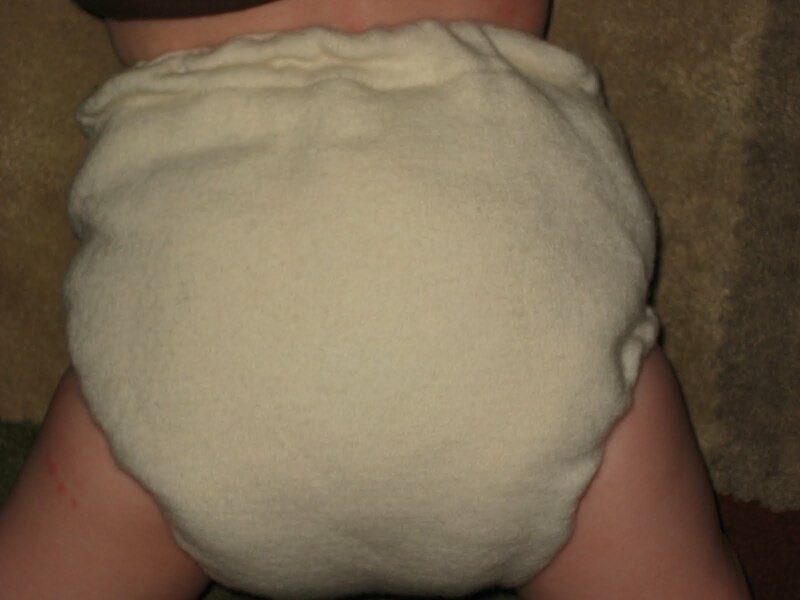 Because the soaker is in the middle of the diaper (it’s very trim too!) rather than being snapped into the back, his tush wasn’t fluffy like I’m used to. 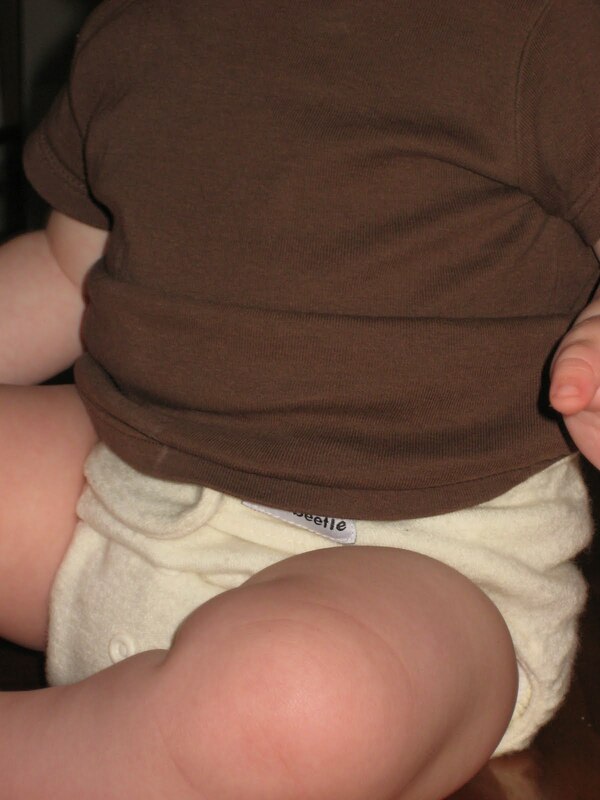 I actually joked that it was weird to be able to feel his hiney through the diaper instead of a mound of fluff! The next time I used it, I put fleece pants over. He wore it for a good two hours and it was fabulous! I also tried it with the Little-To-Big Organic Wool Cover. The cover is 100% organic merino wool and fits 6-36 lbs. It’s mamajammin, yo. I feel like I’m looking for Waldo. I don’t want to miss anything funny on the packaging. Yeah, Mother Nature is a smarty pants, but who figured out we could shave the wool off the sheep and make diaper covers out of it, huh? Who’s the smarty pants now, huh? 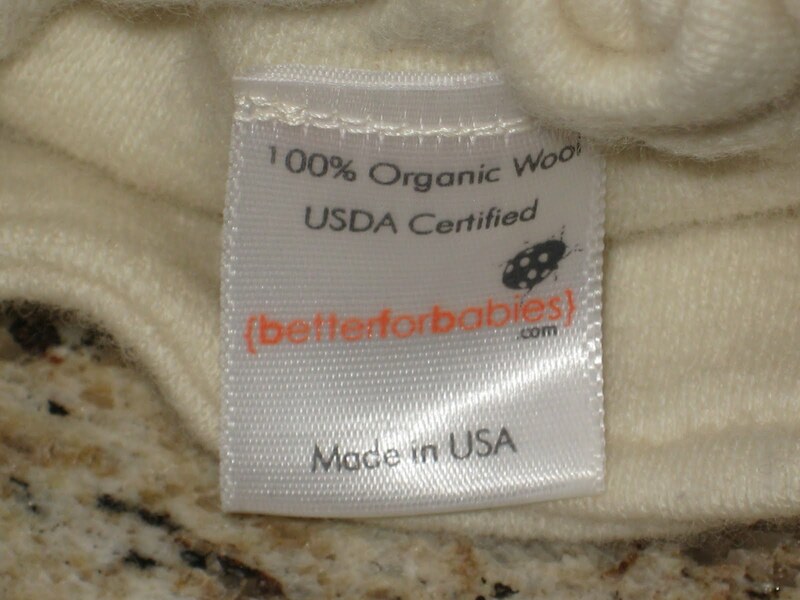 100% USDA certified, organic wool. I received a cover with snap closures, though both the diapers and covers come with your choice of snaps or velcro. I think velcro on the diaper and snaps on the cover are the perfect combo, especially since my son has figured out how to open velcro! 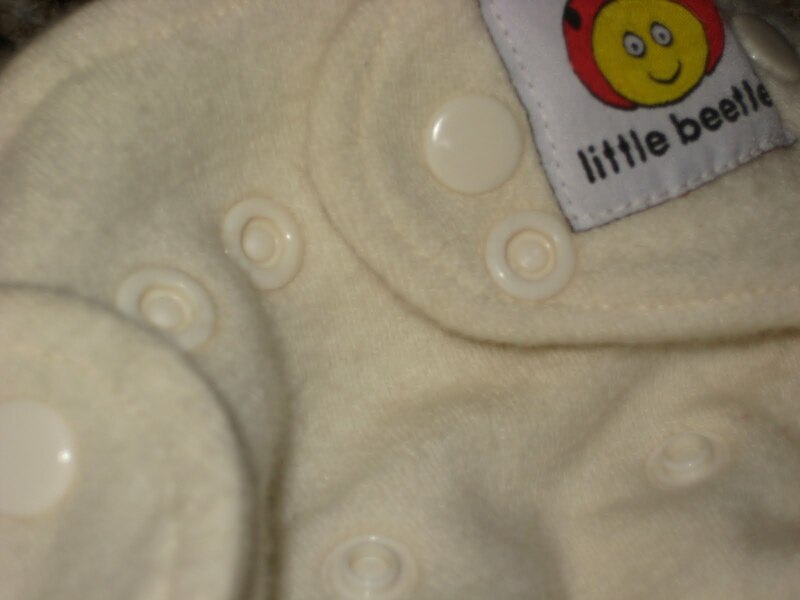 Better For Babies said “we find it’s good to pair one closure with the other…snaps and aplix lining up exactly against one another can cause a funny fit.” You can overlap the snaps for a smaller baby. The cover has the same snap down rise size adjustment that I love. 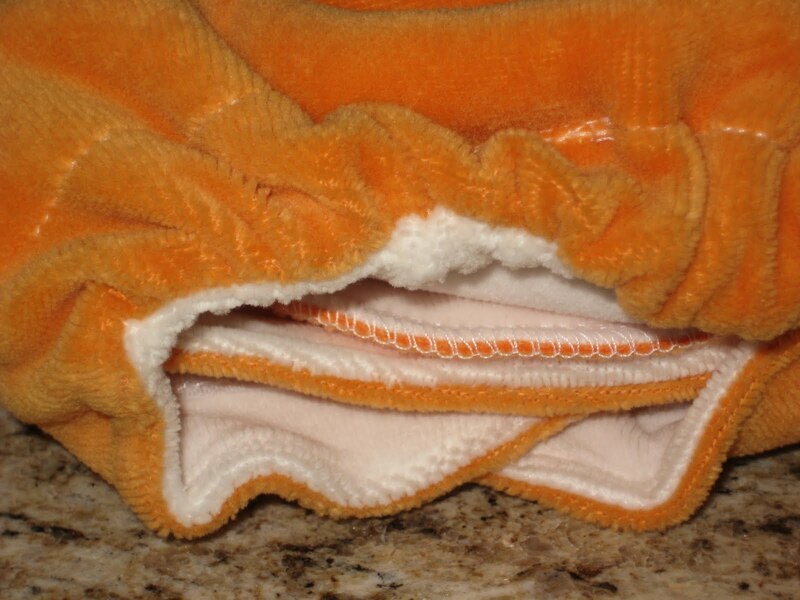 It’s especially nice on a cover since you may need a slightly bigger cover to go over a diaper with a higher rise. The first time I used the cover, I used it over my Licorice Lane Fitted. It’s so nice to be able to adjust the rise on the fly, depending on the diaper you have on under it. The cover didn’t really add any bulk. 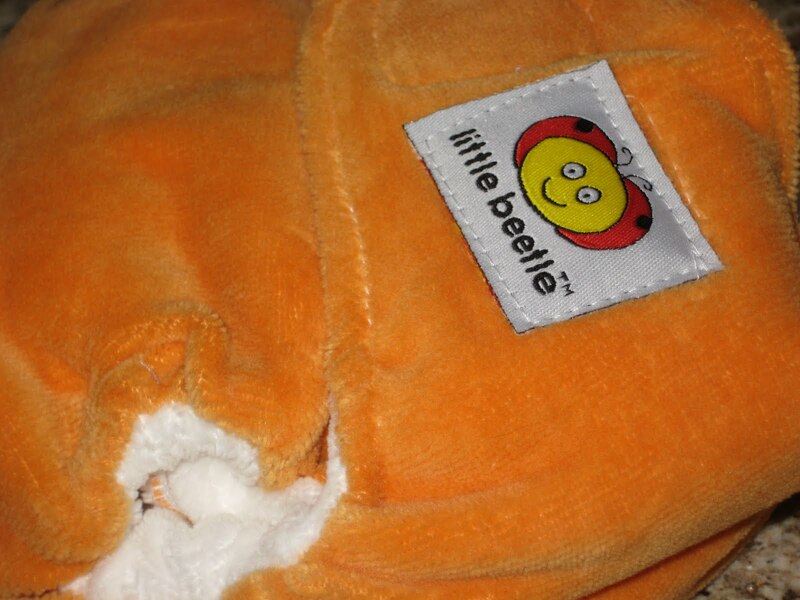 I of course also used it over the Little Beetle Little-To-Big diaper as well. Better for Babies told me that the “snaps do have to be opened and closed gently (since the 100% organic Merino wool doesn’t have any synthetics), but it’s easy to do so.” That makes me wonder if these are intentionally easier to undo, to avoid yanking on the wool. I do wish the rise snaps were just a tiny bit “stickier” though. 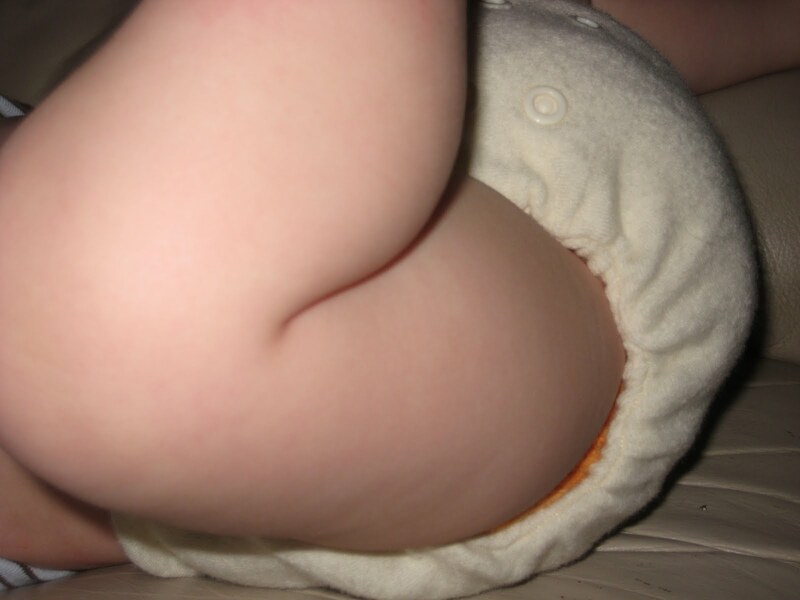 I sometimes inadvertently pop a rise snap on any diaper, usually when I am pulling the diaper to adjust it as I’m putting it on. With the cover, I did it about 3 times in a row and really annoyed myself. I’m sure it is just a learning curve with that. I also popped one somehow with him on my hip. That seems to be my only “complaint” though! This was really trim over the super trim diaper! I love that both the diaper and cover will fit babies from “Little-To-Big.” They may be a bit of an investment, but they will last. I also love that they are completely natural, with no synthetic materials at all and that they’re socially conscious as well. See this diaper on my newborn. 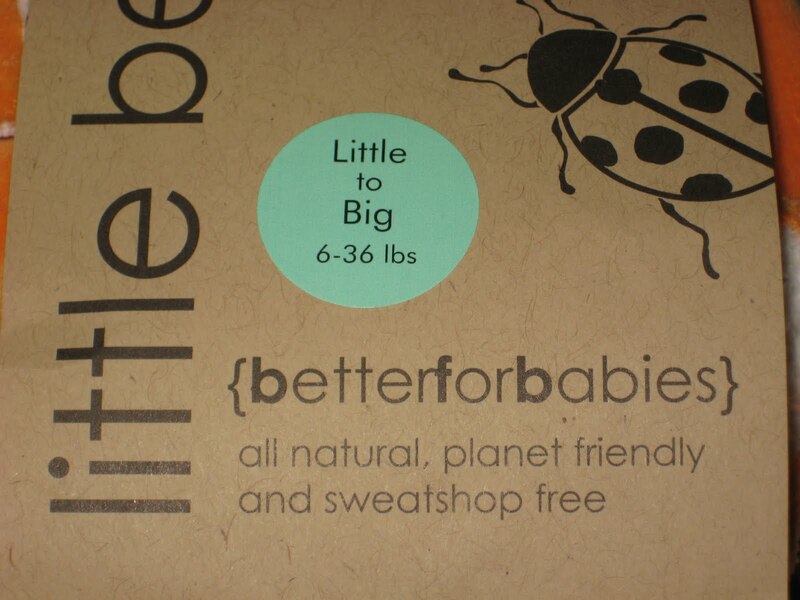 Thank you so much to Better For Babies for sending them to me to review! Of course, my love can’t be bought with diapers, so the freebies in no way affected my review! Check out Better For Babies and Better for Grownups. I’d love to hear what products interest you, and what else you’d like to see me review. Edit August 2010: Although fitteds aren’t really my favorite (I prefer pocket diapers) this is so, so trim, and soft and squishy, I can’t help but love it! 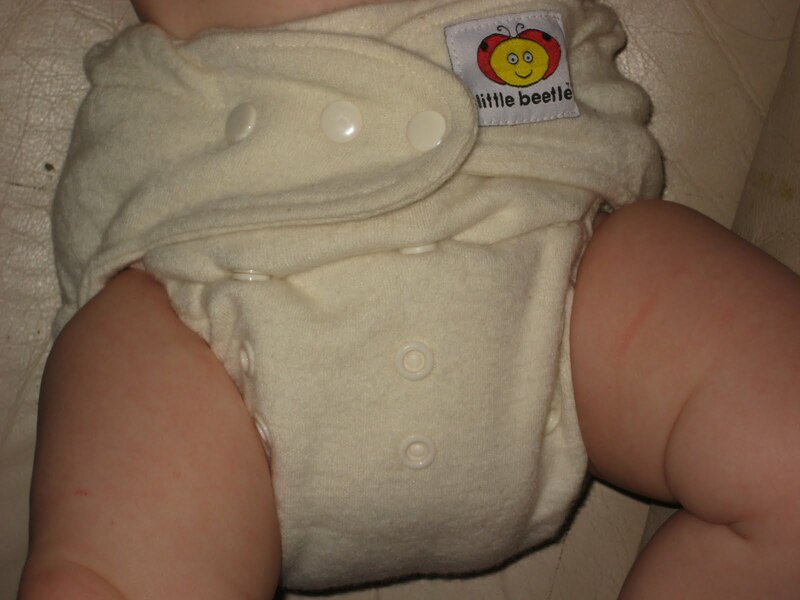 I know this is an old post but wanted to share -I was going through some boxes and found one of my Little Beetles cloth diapers, my son who wore these is now 14! 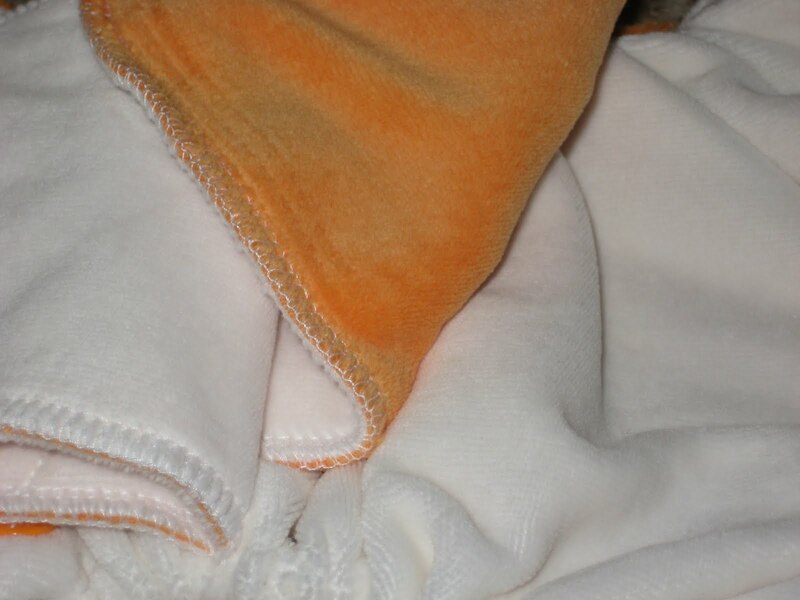 I am expecting baby # 6 in December…have never done cloth before and am determined this time! I insist on organic materials and like the idea of one size since it is an investment…I keep coming back to the the Little to Big Fitted Diaper and the Wool Cover…It seems that my 1 hesitation now is that I keep hearing it really depends on your baby?? It is so confusing because I want to be ready and begin cloth diapering immediately…I don’t really want to try 10 different diapers before settling on 1. Any thoughts?? Will I regret investing over $600 on 1 type of diaper system???? I really don’t recommend putting all your “eggs” in one basket, because it really does depend on your baby! Diaper Junction has a 30 day trial program you might want to consider! >That is a real shame! Did you contact them? I am wondering if they were owned by the same company then? I haven't had any trouble with mine at all! >This review has me seriously considering the brand. Thanks! >I'm so glad my review was helpful! I was surpsed by how much I like them! >Thank you for this review — I've been scrounging for a review on the fitted! Like you, I just tried the cover and am impressed. I have the (discontinued) SB organic velour fitteds and merino covers for my DD (sized), and was really sweating what I would do when another LO comes. Thanks to your review, I think I'll take the plunge to try the fitted on her; if they do as well as you suggest, I think I'll be transitioning to this system with the next one! >Wow! Reading this post has turned me on to this product. 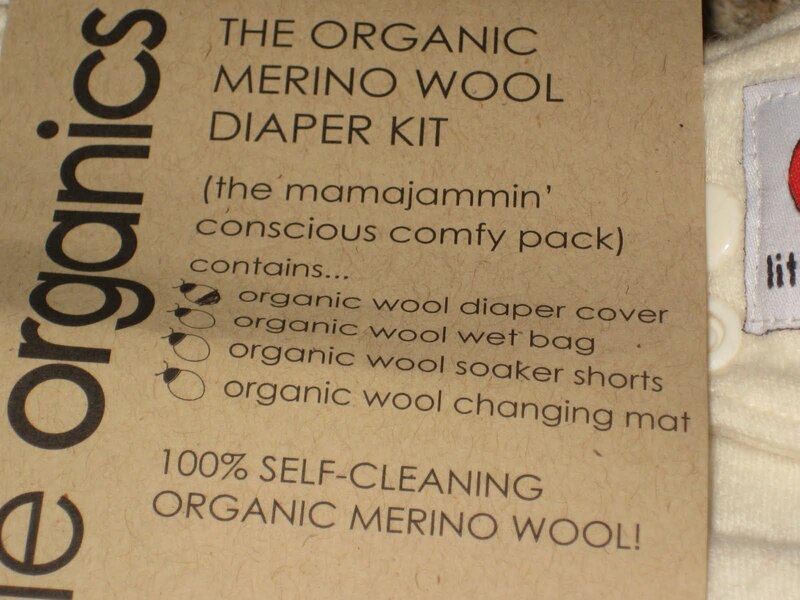 I hadn't really looked much into organic/cloth diapers before since I remember very well my step mother's cloth diapers she used for my youngest sister, and they just seemed to be more hassle than they were worth. But seeing this product and how easy it seems to use, and esp. being hubby friendly (which was another big issue) I will have to consider using these if ever I have another baby (which isn't out of the question in the next few years).